An outright winner from the start, this self-guided seven night cycling holiday explores a sun-soaked region of empty beaches, unspoilt villages and low fertile hills rolling down into the clear emerald seas of the Adriatic. Firmly tucked away 'on the heel of Italy's boot', Puglia offers extraordinary variety and beauty with a dramatically rugged coast, providing a total contrast to the lush green interior. Your holiday starts and ends in the historic town of Monopoli. From here you pedal north up the coast, passing hidden coves and gold sand beaches where you have the chance to eat lunch in colourful fishing villages before heading inland. Here, you'll be intoxicated by the rich colours of the landscape, olive groves, fruit orchards, vineyards and ruby-red fields, all intensified by the wonderful limpid light of the Adriatic. Highlights include staying in unique Alberobello, a UNESCO World Heritage Site, and visiting the postcard-pretty white village of Ostuni as you wind your way back towards the sea. Read more about this holiday in Tiki Chris and Breaking Travel News. Arrive at your hotel for a welcome briefing. 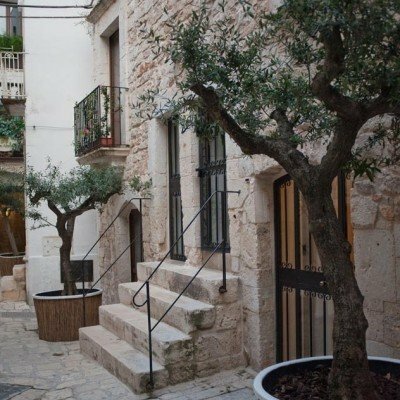 There's time to discover the historic town of Monopoli before dinner in the restaurant. A contrasting, 22km route takes you along the delightful coastline from Monopoli before heading inland to Conversano. En route take time to visit the small, but vibrant fishing village of Polignano a Mare, idyllically perched on the side of the rocky limestone cliffs. Continue through the quaint, picturesque village of San Vito, with its multi-coloured boats moored up in the tiny port, before finishing your journey in the sleepy, beautiful little town of Conversano. Today's pedalling takes you through the rolling hills of the Valle d'Itria where the air is perfumed with wild mint and herbs. Stop off in the little towns of Putignano and Noci, and view their characteristic whitewashed houses and narrow alleyways. 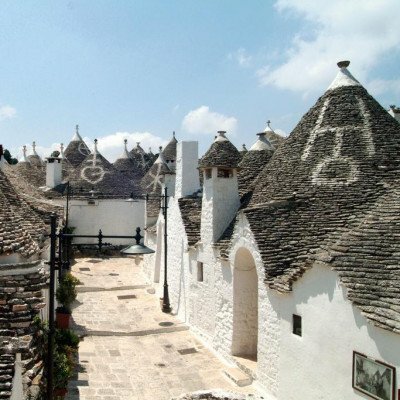 It's then off to unique Alberobello and its plethora of trulli houses, the architectural symbol of the region. On arrival you'll be met by one of the staff, who will show you to your own private trullo house. Spend today roaming around the historic centre, navigating your way through narrow streets, kitsch souvenir shops and tasting local delicacies. Or maybe visit the Museo del Territorio to discover the history of this unique UNESCO World Heritage Site. Alternatively, a circular cycle route (45km/28.5mi - route notes provided) takes you deep into the Itria Valley to visit stunning Locorotondo, with wonderful panoramic views across the valley. Continue on to Martina Franca, a must-see town given its marvellously intact historic centre, beautiful Baroque architecture, and stunning palazzi. You'll spend this morning cycling along beautiful undulating country lanes lined with weathered stone walls, before enjoying a long downhill run with panoramic views of the Adriatic coastline and the lower fertile plains. This incredible descent will bring you down towards Capitolo and finishes through a patchwork of almond orchards, olive groves, vineyards and gloriously coloured fields of fresh tomatoes and peppers. Today you could just relax by the hotel's pool, or cycle to the nearby beach. For the more energetic, a circular cycle ride (48km/30mi - route notes provided) takes you to charming Ostuni whose whitewashed arches and houses are neatly piled like sugar cubes on hills rich in olive groves and vineyards! This morning you leave the masseria and head back to the Adriatic coast on a gentle flat route. You will cycle past the colourful fishing village of Savelletri, a perfect stop for an authentic Italian espresso or to indulge in a delicious seafood lunch. Your ride will continue past the archaeological site of Egnazia, once the location of a Greco-Roman town, dating as far back as 4BC. 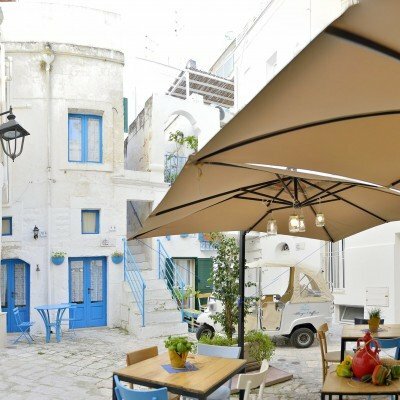 You then return to the picturesque coastal town of Monopoli and the 4-star Albergo Diffuso in time for a stroll before choosing your evening restaurant from one of the many eateries in the heart of the old town. During your holiday you stay at the following hotels. If you'd like to extend your time at any of these or, if you'd like to enhance your stay with an upgraded room, just let us know at the time of booking. If you'd like to keep your bikes with you for any extra nights we can arrange this for you for just £30 per adult per day. As an alternative to Trullidea, stays can also be taken at the Tipico Resort. 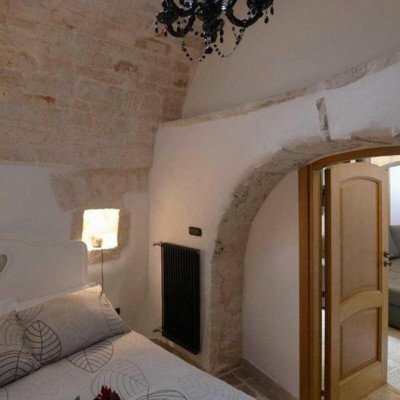 Conveniently located in the centre of historic Alberobello and a lovely experience of staying in a traditional trulli. Each trulli is equipped with air conditioning, Wifi, TV, kitchenette and dining area and offers a comfortable and unique stay. 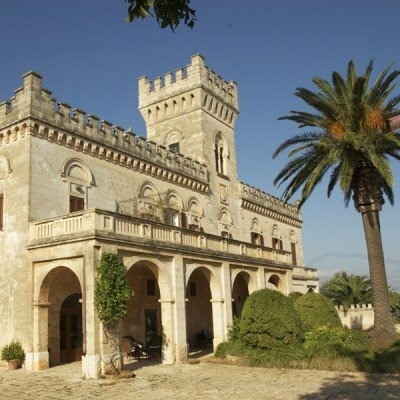 As an alternative to the Masseria Salamina, stays can also be taken at the Masseria San Martino. A beautifully restored 18th Century manor, managed by a wonderfully hospitable Italian-Canadian family. Set amongst acres of ancient olive trees, this is a peaceful rural retreat. 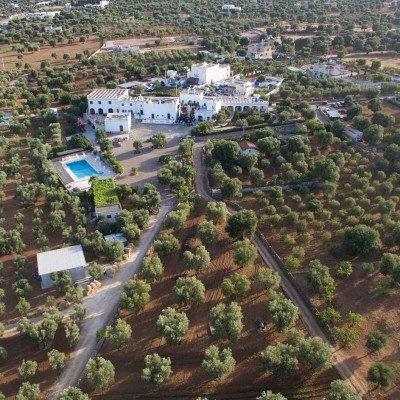 Extra virgin olive oil is still produced by the current owners of the masseria (we recommend you purchase some to take home!). Rooms are elegant and comfortable and the Apulian style breakfasts using with fresh local produce are delicious. A freshwater swimming pool set within the peaceful grounds with a hydro massage corner is the perfect place to relax!. As an alternative to the Albergo Diffuso, stays can also be taken at the Palazzo Indelli. Located by the harbour, this 4 star hotel offers a comfortable and elegant stay right in the centre of Monopoli's old town. Rooms have Wifi, TV and airconditioning and there is an excellent restaurant with an emphasis on sea food, using fresh local produce caught from the hotel's own fishing vessel. An excellent well thought out holiday, that undoubtedly made the best of a beautiful region whilst taking into consideration finding pleasant roads, interesting places, well-placed rest stops and good hotels. The route app on the phone made navigation really easy. It is possible to hire electric bikes for this holiday at a supplement of £215 per person. As these are available on a first come first served basis, we recommend early booking to avoid disappointment. It is possible to hire tandem bikes for this holiday at a supplement of £245 per bike. As these are available on a first come first served basis, we recommend early booking to avoid disappointment. Due to the tailor-made nature of our holidays, we need a little more information in order for us to check availability for Contrasts of Puglia Cycling. Simply complete the form below and a member of our sales team will contact you (when it's most convenient for you) to provide availability information, travel options and an accurate price. Of course there's no obligation, but if you do wish to proceed with a booking they will be on-hand to assist you throughout the process.